Carnotaurus (“meat-eating bull”) is a genus of moderately large abelisaurid theropod dinosaur, discovered in 1984 by Argentinian paleontologist José Fernando Bonaparte. It is known from a single adult skeleton, mostly complete, which was unearthed on the farm Pocho Sastre located in La Colonia Formation of Chubut Province, Argentina. The only known species of Carnotaurus, called C. sastrei, is named in honor of the farm’s owner Angel Sastre. This dinosaur lived during the Maastrichtian age of the late Cretaceous period, between 72 and 69.9 million years ago. Its discovery ushered in a new age of paleontology in the Southern Hemisphere. Carnotaurus was discovered during the eighth Jurassic and Cretaceous Terrestrial Vertebrates of South America expedition sponsored by the National Geographic Society, which also discovered the sauropod Amargasaurus. At the time it was discovered, abelisaurids were not very well understood. The exceptional quality with which the Carnotaurus was preserved allowed paleontologists new insight into its physiology. Extracting the fossil was a laborious process due to its being embedded in hematite concretion, which delayed the animal being named until 1985. A full description was not published until 1990. For many years, it was the best-known abelisaurid and the best-known theropod from South America; since its discovery, paleontologists have discovered numerous other dinosaurs on the continent, including some of the largest dinosaurs ever known. In other parts of the world, new abelisaurid species were discovered (such as Majungasaurus), which helped paleontologists better understand Carnotaurus. Sometime in the late 1980s or early 1990s, at around the same time Carnotaurus was being described and understood, International Genetic Technologies succeeded in cloning the dinosaur from paleo-DNA recovered from amber samples. However, it was never successfully put on exhibit. This abelisaur is large, but lightly built. InGen’s specimens can reach 10.7 meters (35.1 feet) to 10.9 meters (35.8 feet) in length and weigh 1.5 tons in adulthood, somewhat larger than the 7.5 to 9-meter (24.6 to 29.5-foot) fossil specimen. To the top of its head, it can grow to 2.9 meters (9.5 feet) tall. It is built for speed and is believed to be among the fastest large theropods. 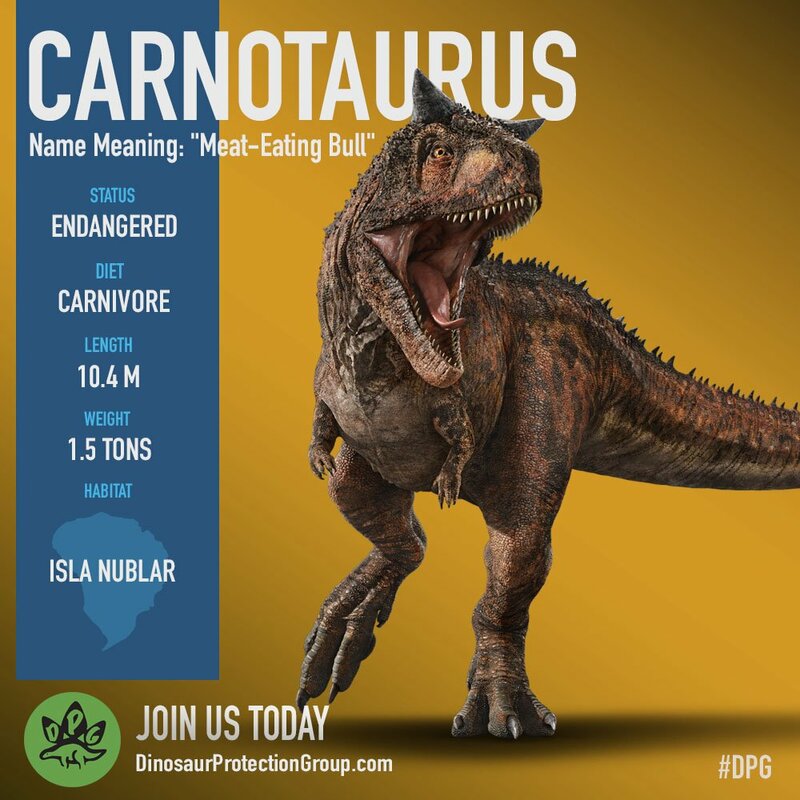 The mobile application Jurassic World Facts gives a higher weight for this animal, 2.1 tons. Its unique appearance makes Carnotaurus sastrei instantly recognizable at a glance. The first thing one is likely to notice about this dinosaur are the large horns, which are roughly triangular in shape and protrude obliquely from above its eyes. InGen research has found that the horns are not used in physical combat, but rather as a form of species recognition. No other known theropod has such prominent horns, making these an easy way for a Carnotaurus to identify its own kind. The skull is noticeably deep, with a short, blunt snout; its eyes are small and round, with yellow sclerae. Both the eyes and nostrils face forward, as evolutionary adaptations to a predatory lifestyle. The jaws can open very wide and are filled with comparatively small but sharp teeth. InGen’s Carnotaurus exhibit shorter and more robust teeth than those of the only known fossil, which has longer, more slender teeth. Its jaw is, compared to its skull, less powerfully built, but the neck is thick, straight rather than curved, and strong. The tongue is pinkish, quite long, and muscular. The second most noticeable feature of a Carnotaurus is the armor on its body. The bones of its head, for example, not only form large horns from the frontals, but also feature pits and spikes which are covered with wrinkled, keratinous skin. The skin of its head is made up of irregularly-patterned scales, while over the rest of the body, its polygonal scales form a regular non-overlapping pattern. Each scale is about five millimeters in diameter. In addition, it has irregular rows of pointed bumps on its head, sides, and tail, which give it some limited degree of protection. Larger such bumps are located toward the dorsal side, whereas those on its flanks are smaller; the bumps are about three to four inches apart from each other. Carnotaurus has a lengthy and powerful tail, which assists in balance while running and to help the animal achieve its high speeds. The caudofemoralis muscle, located between the tail and thigh, is also quite powerful; this permits the animal to deliver strong kicks using its hind legs. The feet are birdlike, like most theropods, with three toes bearing large talons and a small vestigial hallux. Its forelimbs, though, were extremely tiny. The arms of Carnotaurus are reduced even further than in tyrannosaurs such as Tyrannosaurus; it could not even touch one of its hands to another, and the four fingers are so small as to barely be noticeable at all. The first and fourth fingers contain only one bone, and none of the fingers are particularly mobile; it does possess claws on all of its digits, but they are too small to serve any real function. InGen’s specimens have slightly more enlarged arms than the fossil specimen, but they are still far too small to be functional. Like in its other theropods, the hands are pronated, which also differs from fossils. The eyes of Carnotaurus face forward, giving it excellent binocular vision. From head-on, its horns make a clearly visible display. The coloration of Carnotaurus is generally a reddish-brown hue. Most observed specimens have a rusted red body color with shady brown markings, while the horns and osteoderms are dark brown or black. At least one has been seen with a noticeably darker coloration over its body, possessing a mostly dark brown pelt and a reddish streak down each side. A male specimen described in the junior novel Prey has a red stripe down its back. 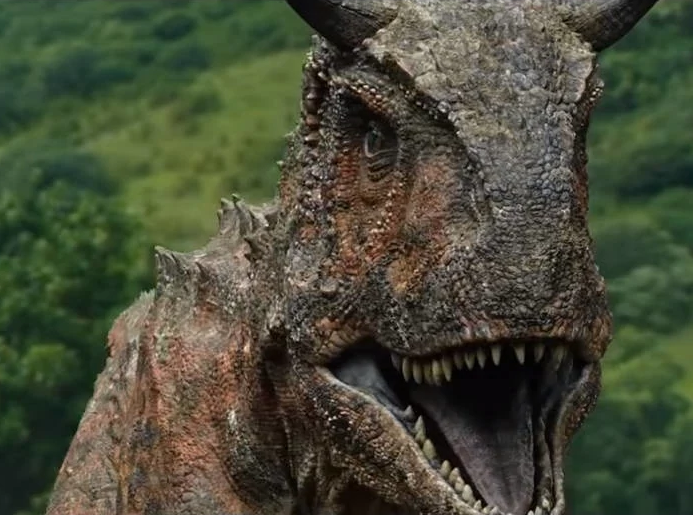 According to Jurassic World: The Game, InGen’s Carnotaurus possess the ability to change their skin color in order to camouflage with their environment, but this has not actually been observed in the animals. It is unlikely, but possible, that the presence of chromatophores in the skin is limited to specimens originally bred by InGen on Site B, and that they are absent in those bred on Isla Nublar during the twenty-first century. This hypothesis would be contingent on whether InGen’s original specimens bred in the late 1980s or early 1990s are different versions than those bred later. Only the adults have been observed thus far. A hatchling can be created in the mobile game Jurassic Park Builder, which shows a proportionally larger head and smaller horns than the adult. This animal, however, does not closely resemble the ones seen in the film canon itself. While its growth rate is not known, a female Carnotaurus hatched in 2008/2009 was a fully-grown adult by 2018, so it reaches adulthood in at most nine or ten years. This growth rate may have been boosted by growth supplements provided by its creators, or by genetic modification. The two known color morphs of Carnotaurus have been suggested to be an example of sexual dimorphism, though this is currently unconfirmed. The rusted-red color morph is known to occur in the female, based on the Dinosaur Protection Group website as well as several external sources. The darker color morph is hypothesized to be the male; this is based on its more vibrant color, the fact that only one individual of this morph is known, and that individual’s highly combative behaviors. Carnotaurus has been sighted at the edges of forests, similarly to Tyrannosaurus rex. Like its larger neighbor (and ecological analogue), it likely prefers such environments due to the ready availability of cover which allows it to ambush prey and hide from danger. If any Carnotaurus versions were camouflage-capable as Jurassic World: The Game claims, forested habitat would benefit them as well. Due to its opportunistic nature, though, Carnotaurus often ventures into the open in order to locate food sources. In the game Jurassic World: Evolution, a proper habitat for Carnotaurus should consist of 16,900 square meters of grassland and 4,300 square meters of forest. Between late September 2004 and Jurassic World’s opening date at the end of May 2005, any Carnotaurus that still survived on Isla Sorna would have been shipped to Isla Nublar. There, they would have been briefly kept in the quarantine paddock before being introduced to habitats in Sector 5 in the north of the island. It is not known how many, if any, individuals survived up until that point. 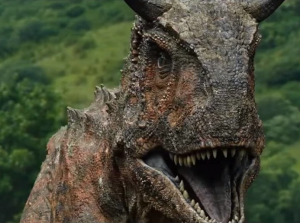 The first Carnotaurus truly confirmed on Isla Nublar was a female which hatched between May 16, 2008 and May 15, 2009. Between this date and Jurassic World’s December 18, 2015 closing date, the Carnotaurus were maintained in habitats in Sector 5. Population statistics remain unknown for that period of time. As of the park’s closing, these animals were still not ready for exhibition, and were not advertised on the park website or merchandising. After the park closed on December 18, the Carnotaurus were released into the wild of the island. 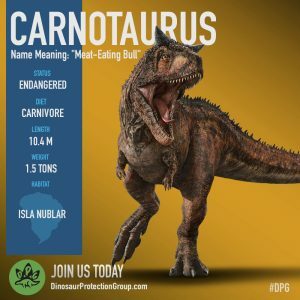 Based on population monitoring shown on June 22, 2018, Carnotaurus were known from the northeastern part of Isla Nublar, near the northern end of the Jungle River. 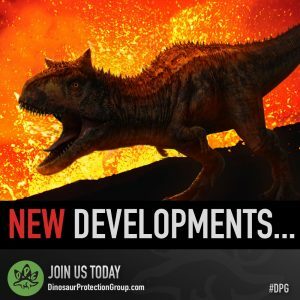 Artwork on the Dinosaur Protection Group website suggests that at least two adults lived in what was once the tyrannosaur paddock, which had gone mostly untouched during Jurassic World’s ten years of operation. On June 23, 2018, at least two adult Carnotaurus were observed just east of Mount Sibo. One of the animals was killed in territorial conflict with a Tyrannosaurus, while the other was driven over a cliff during the volcano’s eruption. While it was seen attempting to swim to safety, it is unlikely that it survived following the island’s destruction. At least two other Carnotaurus were removed from the island by Ken Wheatley and mercenaries via the S. S. Arcadia. Any other animals remaining on the island would either have died during the eruption and its immediate aftermath, or starved due to a lack of prey. InGen bred Carnotaurus on Isla Sorna sometime between 1986 and 1993. 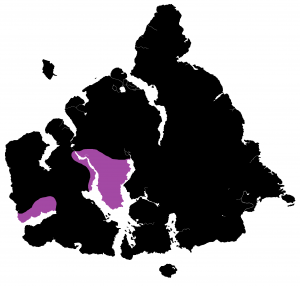 Population statistics remain unknown for that period of time, as do the animals’ range; John Hammond‘s statements in 1997 would imply that the Carnotaurus inhabited the island’s central reaches. 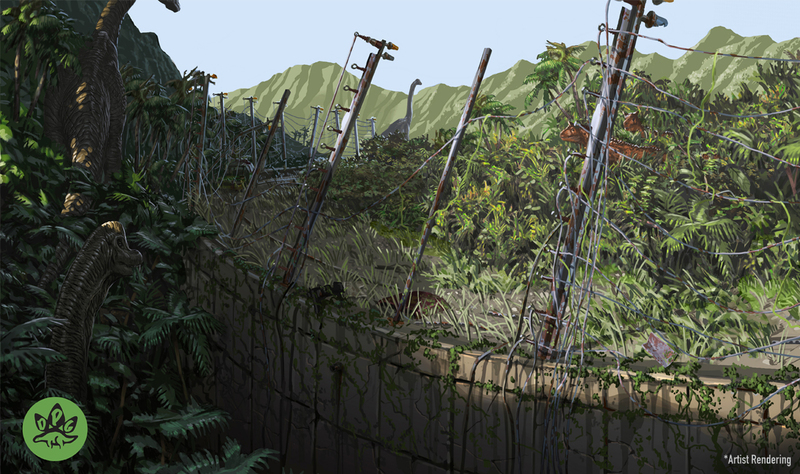 As of last count in 1993, InGen reported two Carnotaurus living on Isla Sorna. In an earlier script of Jurassic Park ///, an adult Carnotaurus would have appeared on the bank of Isla Sorna’s central channel in the southwestern region of the island. This role was eventually given to a Ceratosaurus. Hypothetical range of C. sastrei on Isla Sorna between 1997 and 2001. The junior novel Prey, which has not been reviewed by Universal Studios for film-canon status, shows three adult Carnotaurus including at least one male inhabiting the area near Mount Hood at the end of 2001. The third animal, if both this source and InGen’s own documentation are to be considered canon, is likely the offspring of the other two. They were relocated to another part of the island on December 30; what became of them afterward is unknown. 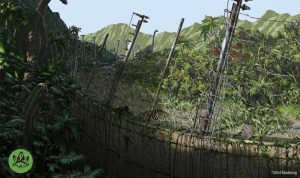 Between 1998 and 2004, Isla Sorna experienced an overpopulation crisis which resulted in the total collapse of its fragile ecology. If any Carnotaurus still lived on Isla Sorna in 2004 or 2005, they would have been relocated to Isla Nublar by Masrani Global Corporation. Carnotaurus among several other dinosaurs, Lockwood Estate (6/24/2018). Note the distinctive facial scarring. At least two Carnotaurus were removed from Isla Nublar on June 23, 2018 by a mercenary team led by Ken Wheatley at the behest of Eli Mills. The animals were stored at Benjamin Lockwood‘s estate after arriving on the night of June 24 via the S.S. Arcadia; due to a hydrogen cyanide leak, they were released into the surrounding forest by Maisie Lockwood. Their current locations are unknown. Carnotaurus may be cathermal, active periodically throughout the day. 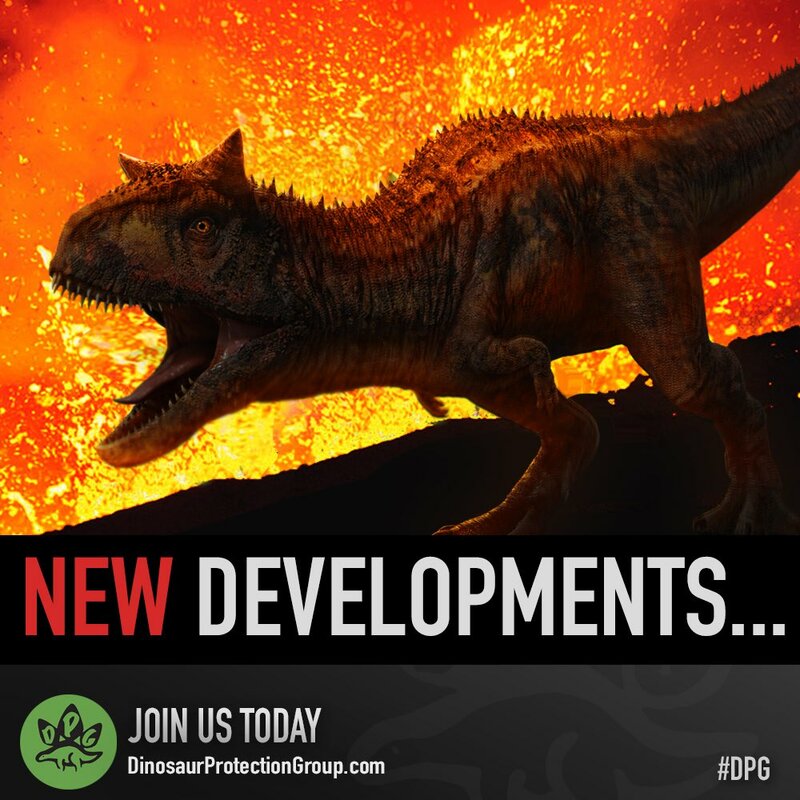 In DPG artwork as well as on June 23, they were seen active during the day; due to human interference, they were later active at night. The junior novel Prey describes them as engaging in territorial behavior during the morning near sunrise, and later engaging in hunting behavior late at night. In the mobile game Jurassic Park Builder, the Carnotaurus is active for four hours at a time. In the game’s sequel, Jurassic World: The Game, it is also active for four-hour periods at a time. The Carnotaurus is a carnivore; even its genus name, which means “meat-eating bull,” references its diet. While most of its dietary preferences are not known, it has been observed attempting to prey on Sinoceratops; this suggests that it might feed on species considerably bulkier than itself. It has also been seen feeding on humans. The application Jurassic World Facts states that it preys upon turtles and the sauropod Chubutisaurus, which has not been cloned by InGen. These sources all together suggest that Carnotaurus mainly feeds on small or medium-sized prey, but is capable of taking down larger prey when it sees the opportunity. It is a calculating hunter, scoping out and sizing up its prey from a distance before racing in to attack. While it may hunt by ambush, its speed gives it an edge; it excels at chasing down prey items and is shown to be perfectly capable of tackling prey from a position out in the open. When attacking larger prey items, it will make quick biting attacks to tug at the prey; it may also try and topple the victim by ramming with its side, as well as delivering powerful kicks with its legs. It is a clever fighter, frequently attempting new strategies in order to overcome challenges it faces. It is known to capitalize on any situation that gives it the advantage when hunting. On June 23, a Carnotaurus was seen taking advantage of the panic caused by Mount Sibo’s impending eruption to try and capture stragglers in the wake of a stampede. Another Carnotaurus used its swiftness to steal food directly out of the jaws of a Tyrannosaurus in an example of kleptoparasitism. It is just as likely to be a victim of such behavior, according to Jurassic World Alive; this game’s fact file claims that Tyrannosaurus often steals food from Carnotaurus using its superior strength. As a result of this risk, Carnotaurus eats food rapidly after making a kill. Little is known about the social behaviors of Carnotaurus. It does not appear to be particularly fond of company, as they are not seen in large groups and often are solitary. The horns, however, are used in social functions; InGen scientists have determined that they are not used in physical combat, but rather serve a species-recognition purpose. It is possible that individual Carnotaurus may tell one another apart by differences in their horn shapes. 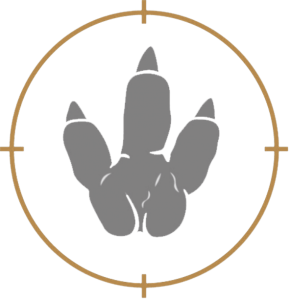 Artwork from the Dinosaur Protection Group. A pair of Carnotaurus are depicted to the right. A trio of Carnotaurus appears in the junior novel Prey, which gives some amount of insight into their social lives. The groups are led by a dominant individual, in this case a male dubbed “Big Red,” who leads charges in defense of territory and during hunts. Non-dominant animals may attempt to usurp the leader after the leader fails at a hunt or territorial attack, but rather than by using physical violence, the attempted usurper moves to the front of the group while traveling in a show of dominance. The leader, in this particular case, reestablished his dominance by biting at the subordinate animal and taking the lead again. In Jurassic World: Evolution, the Carnotaurus is typically a solitary animal, but may live in pairs. As with all dinosaurs, the Carnotaurus reproduces by laying eggs. It presumably has a cloaca, as with other dinosaur species, but details about its courtship behavior, mating, and reproduction are unknown. Carnotaurus announces its dominance in a hunting scenario with a loud roar. Carnotaurus communicates with low, rumbling roars and bass-like howls. It can be heard vocalizing loudly even when it is on its own, suggesting that its calls may serve to communicate to other species as well as its own kind. 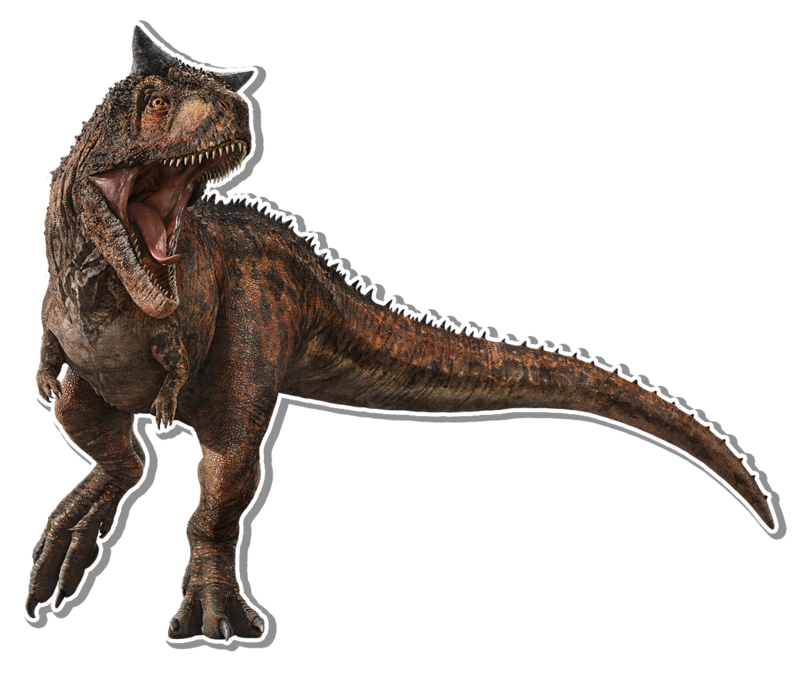 For example, a Carnotaurus produced loud cries while approaching several humans on June 23; it was not hunting the humans, but rather scoping out the tail end of a stampede for vulnerable stragglers. The dinosaur may have been threatening the humans to keep back, claiming the stampede’s weakest as its own prey. During the confrontation, it also used eye contact to intimidate the humans. It was later heard growling and roaring in frustration after failing to make a kill, immediately charging the humans while roaring at them. When socializing with its own kind, the Carnotaurus uses its horns as visual signals. The game Jurassic World: Evolution suggests that it does use its horns as shock-absorbing structures during headbutting displays against its same-species rivals, but other sources with higher canon priority contradict this, stating that the horns exist purely for visual display. Despite its predatory nature, the Carnotaurus is quite tolerant of other animals nearby. It lived in close proximity to other large carnivores on Isla Nublar, such as Baryonyx, Teratophoneus, Allosaurus, and Tyrannosaurus; while it may have competed with Allosaurus and Teratophoneus for prey, it would probably not have faced competition from the fish-eating Baryonyx. On the other hand, the larger but slower Tyrannosaurus directly competed with it for food, and conflict between the two was common. Both species are known kleptoparasites, and they were often one another’s victims; the speed of the Carnotaurus enabled it to rush in and steal food, while the superior physical strength of the Tyrannosaurus allowed it to overpower a Carnotaurus at a kill site. A Carnotaurus steals food from a senescent female Tyrannosaurus. These two species of theropod are frequent kleptoparasites and often target one another. Numerous herbivorous dinosaurs also lived in the same habitat as Carnotaurus, many of which could have served as its prey. It is known to at least hunt Sinoceratops, and older versions of the script show that it would hunt and eat Pachyrhinosaurus in the same manner. Triceratops also inhabited the same area of Isla Nublar, and as Carnotaurus is known to feed on horned dinosaurs, this species may have been a part of its diet as well. Other herbivores known to inhabit its territories in northeastern Isla Nublar include the armored Stegosaurus, Peloroplities, and Ankylosaurus, the hadrosaur Parasaurolophus, and the sauropods Apatosaurus and Brachiosaurus. These sauropods were likely too large for it to hunt. It also lived in the same area as the fleet-footed omnivore Gallimimus, the pterosaur Pteranodon, and the tiny carnivore Compsognathus, which has been confirmed to steal scraps of food from kills. Much like how Carnotaurus is weaker but faster than Tyrannosaurus, the Compsognathus are far smaller than Carnotaurus but are quick enough to avoid it. Eye contact is a non-vocal method of communication used by Carnotaurus to intimidate other animals. Due to its propensity to prey on and compete with dinosaurs that are larger than itself, Carnotaurus must be able to withstand serious physical hardship. Its armored body assists with this, as do its numerous physical adaptations to brawling. When entering into a dangerous situation, it will assess its opponent from a distance before charging in. During combat with prey or competitors, the Carnotaurus uses its jaws, strong legs, and speed to its advantage. They are capable of surviving serious injury and may be seen with heavy scarring. An extreme example can be observed in a specimen retrieved by Ken Wheatley, which shows damage to the left side of the skull in the form of a broken horn and large facial scars which appear to come from a spinosaur’s claws. In spite of these severe injuries, the animal was still in good health and capable of competing with a Tyrannosaurus rex for food sources. While its tough, scaly skin and armor protected it from many forms of attack, it was still vulnerable to hematophagous parasites. These blood-sucking organisms, such as female mosquitoes, would most likely affect its mucous membranes, such as the nostrils and gums. Parasites in its native Cretaceous period enabled InGen to eventually clone the animal; it is not currently known if modern descendants of these ancient parasites still affect it. In Jurassic World: Evolution, it is susceptible to infection from Rabies lyssavirus, the rabies virus. In real life, this virus is only known to affect mammals; the game justifies this odd exception by claiming that the dinosaurs’ modified genomes makes them more vulnerable to disease. The junior novel Prey prominently features interactions between humans and Carnotaurus. The dinosaurs are not tolerant of humans in their territory and make attempts to drive the humans away, despite being subject to several acoustic weapons. The book also demonstrates that they are capable of recognizing individual humans, similarly to crows, and can hold grudges. While Carnotaurus was bred on Isla Nublar by Masrani Global Corporation, it was not yet ready for exhibition in Jurassic World by the time the park closed. Its pugnacious behavior may have been a factor in this. However, InGen did make use of the animal; some of its structural genes were utilized to construct the artificial Indominus rex genome. 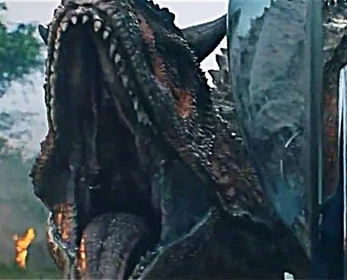 The horns of the Indominus were derived from abelisaurid gene donors, such as Carnotaurus. The Dinosaur Protection Group frequently used Carnotaurus imagery to garner public support for Isla Nublar’s dinosaur inhabitants. On June 23, 2018, a Carnotaurus appeared to threaten three humans involved with a Dinosaur Protection Group operation while the carnivore was hunting stragglers in a stampede. When its quarry escaped, the Carnotaurus then became aggressive toward the humans; it was likely intending to prey on them instead of its original target, but its behavior suggests that it also was highly frustrated at missing its kill. The fact that it originally made warning signs at the humans suggests that it may have blamed their presence for its failure in the hunt. Carnotaurus was among the species targeted by Ken Wheatley and associates, and the species was removed from Isla Nublar for auction. 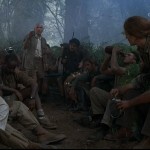 A notably battle-scarred individual escaped from the site; it did not cause any casualties, but did attempt to steal the body of Eli Mills from the Tyrannosaurus that had lashed out and killed him. A second Carnotaurus was also briefly seen escaping from the site. Imagery of Carnotaurus was often used by the Dinosaur Protection Group to garner support for the dinosaurs of Isla Nublar. It was the first dinosaur featured on their social media that was not housed in Jurassic World in any capacity.